The mission of our Faith for Family initiative is to empower local church members to share Christ and the gospel with families in communities across Pennsylvania. This is a journey of faith! Won’t you join us? “Faith for Family” came as an answer to prayer. The goal was to share the love of Jesus Christ and the Gospel with families across Pennsylvania. On September 12, 2015, “Faith for Family” was launched in Philadelphia and Reading. Over 1,300 believers, consisting of: teachers, pastors and Christian students converged on these two cities and shared more than one million pieces of literature about Jesus with people. As a result, 120 small groups were started and more than 100 people gave their lives to Jesus through baptism. The following year, on October 1, 2016, over 1,300 christian believers from across Pennsylvania were deployed, but this time to Western Pennsylvania. Thousands of Bible Study Enrollment Cards were mailed out into the community to get Bible studies started. Bible Workers were sent in advance to assist churches and start working in the community. Spiritual revival has taken place in many of the churches. Then on October 14, 2017, in Central Pennsylvania, over 1800 church members/missionaries from across Pennsylvania and several other states participated in the “Faith for Family” mission project. Currently plans are underway to reach Northeastern Pennsylvania. Join us on September 15, 2018 and help us distribute literature and make connections with the community. Talk to your local church for more information! Christ’s last words to His disciples were: “Lo, I am with you always, even unto the end of the world.” “Go ye therefore, and teach all nations.” Go to the farthest bounds of the habitable globe, and know that wherever you go My presence will attend you…To us also the commission is given. We are bidden to go forth as Christ’s messengers, to teach, instruct, and persuade men and women, to urge upon their attention the word of life. And to us also the assurance of Christ’s abiding presence is given. Whatever the difficulties with which we may have to contend, whatever the trials we may have to endure, the gracious promise is always ours, “Lo, I am with you always, even unto the end of the world.”—Manuscript 24, 1903. Join us as we go door-to-door in the communities in Northeast Pennsylvania! Training available to all Bible instructors, church members, church leaders and pastors. Bible instructors are an important part of the Faith for Family Initiative. 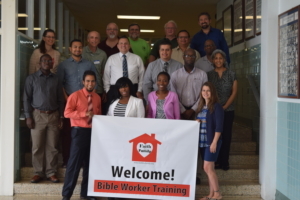 Each summer, Bible instructors, along with lay members who want to learn more about sharing the gospel, experience a training-intensive to prepare them for their year-long role partnering with local churches, connecting with people seeking to learn more about God, building relationships, and sharing Bible studies as members plan for their Faith for Family evangelistic outreach. After the series, Bible instructors continue to study with people in the community and connect them to the local church where they can build relationship with members and with God. To learn more, contact Lillian Torres. Download Bible instructor job description. Download Bible instructor job description in Spanish. Download Bible instructor salary and benefits description. Download Bible instructor salary and benefits description in Spanish.